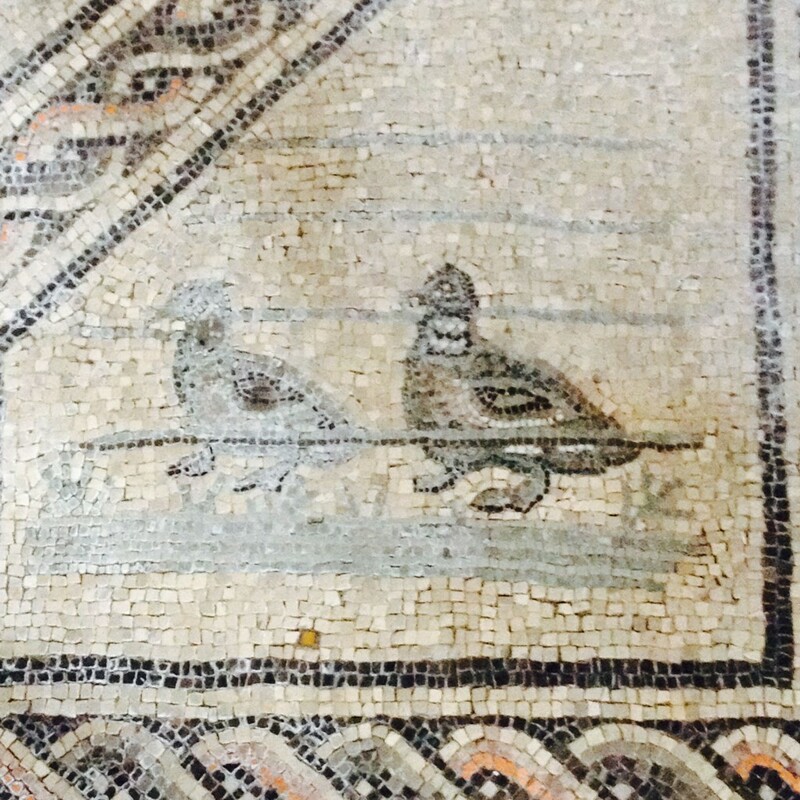 In my last post, I shared some photos of the late antique basilica at Poreč, in Istria. Here, without much comment or introduction, are some more from the same part of the world, but across a few borders. 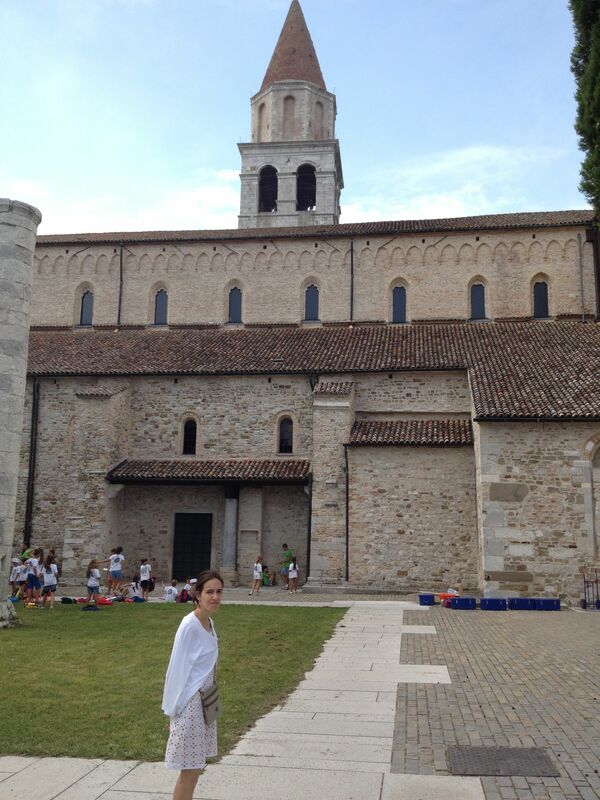 Aquileia, close to the coast of Friuli Venezia Giulia in NE Italy, is an amazing place. It was a Roman port town (founded during the republic), and remains of the port survive. It has been excavated, and there are wonderful remains of all kinds (also a lot of mosquitoes: the remains of the port are on marshy land, then connected to the sea by inland waterways). This time, however, I visited only the Patriarchal Basilica. Here you see it from the outside: an impressive enough large medieval church. Inside, however, and underneath, it is astonishing. 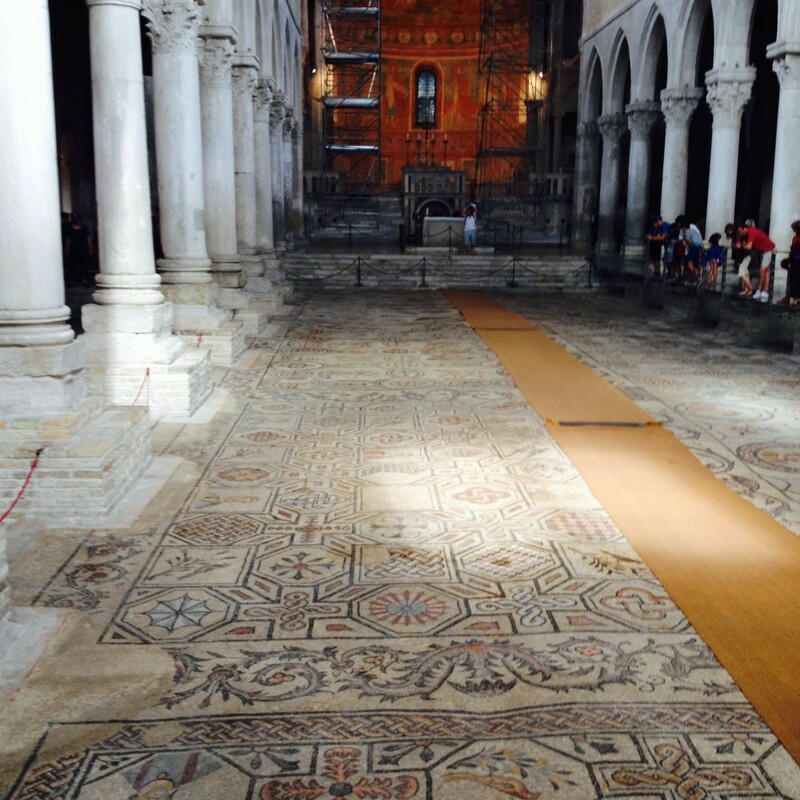 The medieval church was built on the same site as a much earlier church from late antiquity, whose remarkably well-preserved mosaic floor, from the fourth century AD, makes the floor of the nave today. The variety of scenes is amazing. Many show animals of all different kinds. I include this picture of a pair of humble ducks (I take photos of the ducks on the lake here at Nottingham, too…). Some of these have symbolic meaning. According to the guidebook (I’m a classicist, but I work on ancient literature, and especially Greek poetry; I’m not speaking from expertise here! 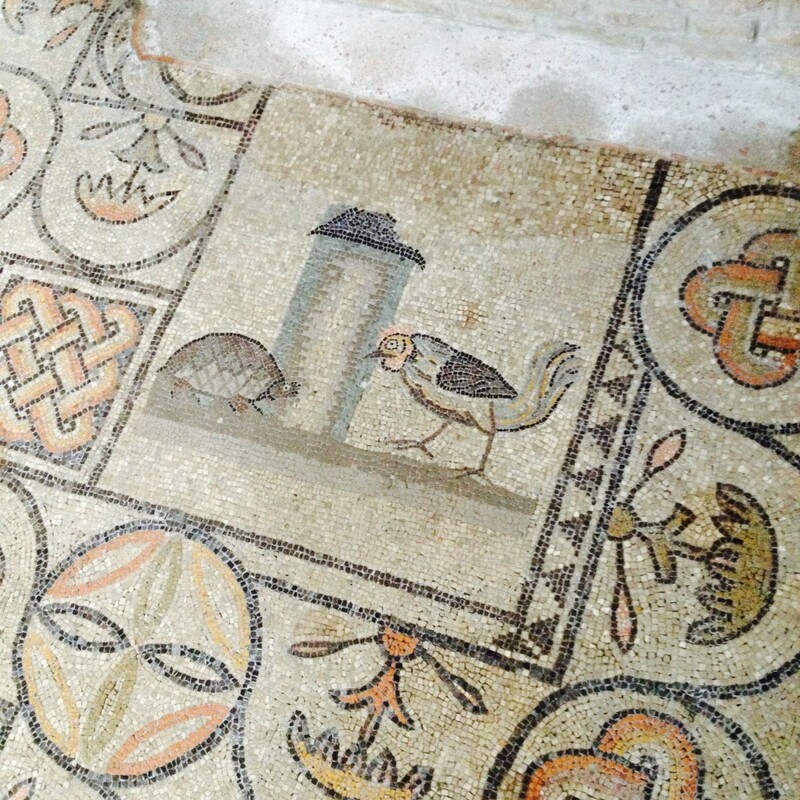 ), the tortoise signifies darkness and sin; the cockerel is brightness and salvation and thus the light of Christ. 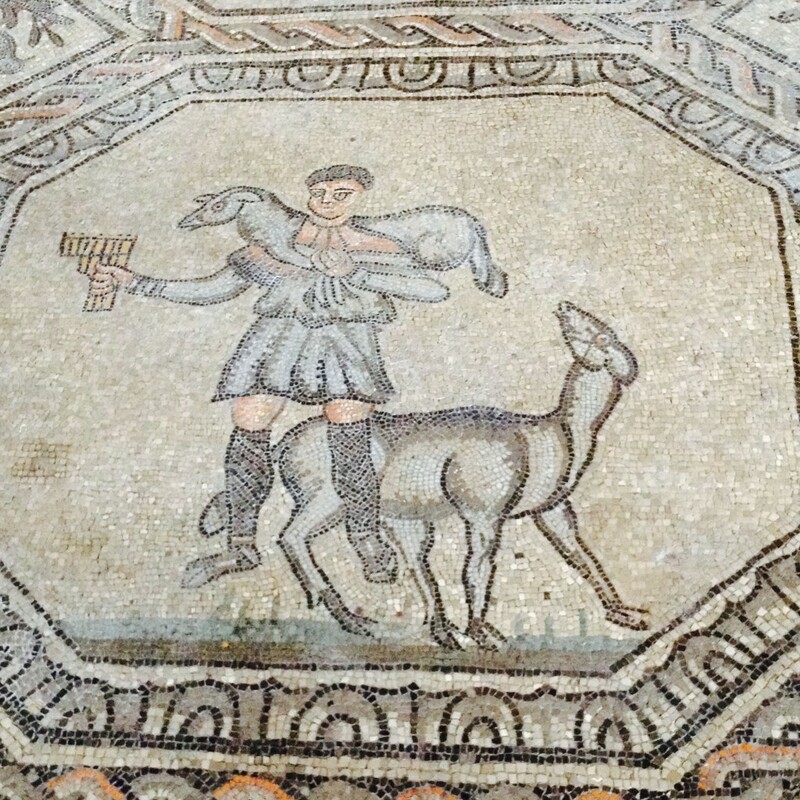 Here is the Good Shepherd, and like other ancient shepherds from Theocritus, and Vergil’s Eclogues, and elsewhere, he is a musician, here with pan-pipes. What is the sheep on the right thinking?! This is an especially interesting redeployment of ancient pagan imagery for Christian ends. 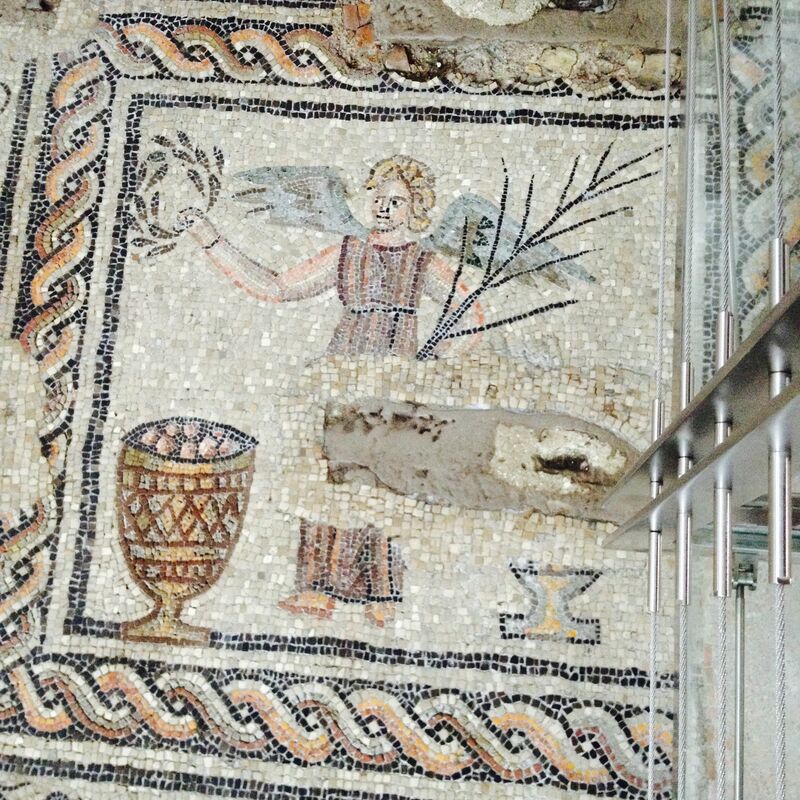 The winged figure carries a palm and a wreath of laurel leaves, ancient symbols of victory. But the vessels in front (one of them damaged) represent the bread and wine of the Eucharist. The crowning glory, however, is a narrative sequence telling the story of Jonah. We often say that Jonah was eaten by a whale, but the word used in the Septuagint (the ancient translation of Hebrew scripture into Greek) can describe all kinds of big sea creatures; the Latin ‘Vulgate’ translation says ‘a big fish’. (The Hebrew doesn’t specify a whale either: thanks to my friend Juan for this – I can’t read Hebrew!). 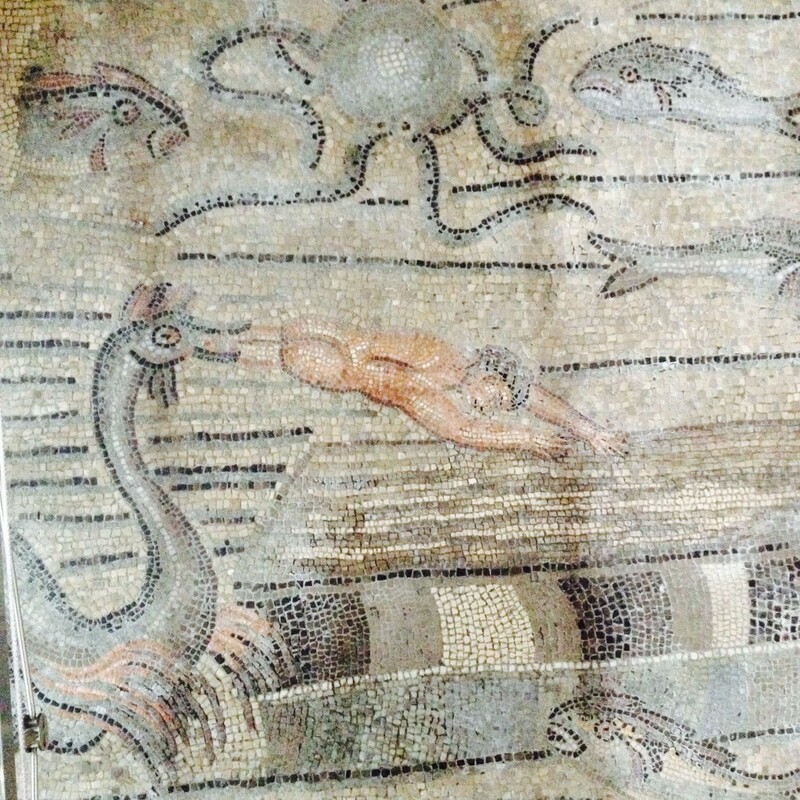 The artist(s) of the mosaic floor imagined this wonderful sea-monster, here seizing Jonah as he is cast out of the ship (Jonah 1: 15-17). As the basilica at Poreč, so this one is still a church as well as a museum. In many ways the modern presentation of the building is done very well. There is a fee, but it is not huge. 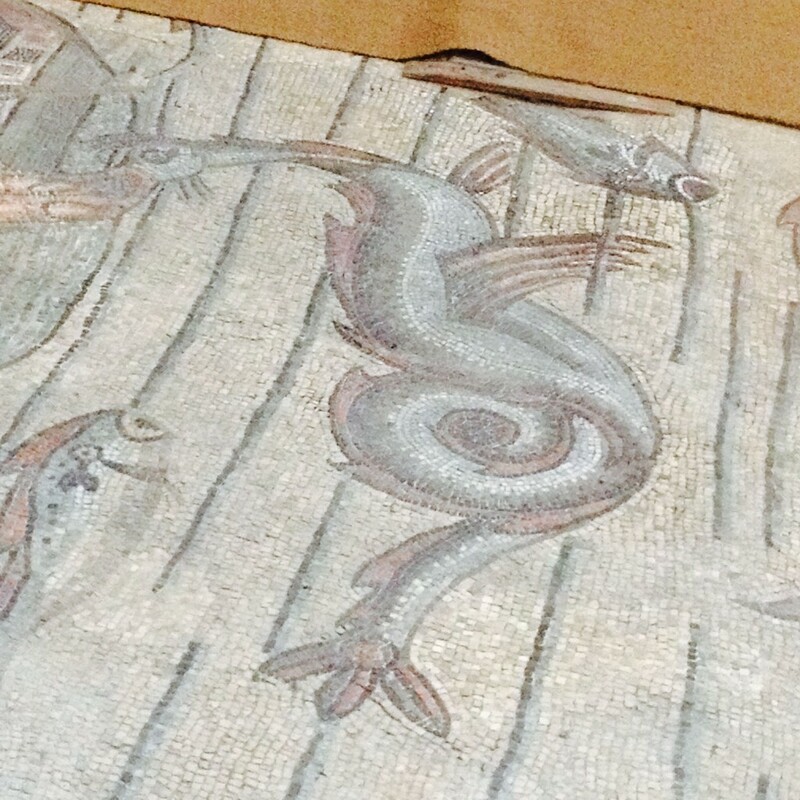 You can see the mosaics quite close without damaging them by walking on transparent perspex (or something of that sort) walkways, and the lighting is good. There are rules concerning dress, and women who seemed to me perfectly respectably dressed were made to cover up (I was wearing shorts and a t-shirt, and my knobbly knees were apparently inoffensive: I got the impression only women’s bodies were Inappropriate). While I can understand all of this – it is a church, and I don’t feel it’s for me to tell the diocese how to run it – I did feel that if somebody were there to pray, the loud voice of the custodian telling people off for their insufficiently modest clothes or for using the flash on their cameras would have been more of a distraction than the tourists themselves. But I shouldn’t end on this grumpy note: it is a wonderful place. There are also more mosaics in other, excavated parts of the late antique basilica complex, and under the church is a crypt with wonderful twelfth century frescoes.